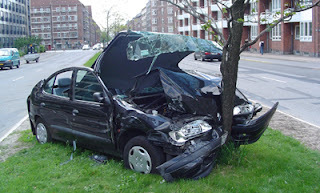 Even the best drivers may be involved in a traffic collision. A momentary lapse of vigilance on your part, or that of another driver, could mean that you have to make an insurance claim. To help you through the process, we've included a step-by-step list of what to do after an accident. Nothing good can come of playing the blame game after an accident. Stay as calm as possible and make sure that nobody is hurt. Avoid confrontation with the other driver and focus on making sure all parties are safe and that the cars are out of the way of traffic. As just mentioned, moving the cars out of the way of traffic is important for preventing further damage to your vehicle. Do so only if the accident is minor and nobody is seriously injured. If someone is seriously hurt, call an ambulance immediately and do not move the car unless absolutely necessary. Fuel leaks from the vehicle can turn deadly if your vehicle remains on. Put on your hazard lights to alert other drivers of your presence. Even if the accident is minor, contact the police. You're required to do so. Write down the information of all parties involved in the incident, as well as witnesses. Get license plate numbers and addresses along with names. It's also essential that you get the insurance information of the other driver. Contact your insurance agent; he or she will be able to guide you through the process and give you further advice on how to handle the situation. Gather evidence of the accident. Don't go "CSI" with your camera and photograph every inch of the scene, but it is important to get a few wide shots of the accident as well as some close ups of the damage. In the digital age, you don't have to worry about film; take as many photos as you can! However, keep in mind that the police and insurance companies will do their own thorough investigations if it is deemed necessary. If you're with Sharp and have an iPhone, you can use the app we've developed to guide you through the process. The focus of conversation between you, the other driver, and the police officer is to determine the facts. Do not admit fault at this point or accuse the other driver of being at fault. Be truthful about what happened, but do not state that you are at fault.